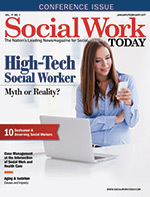 The High-Tech Social Worker -- Myth or Reality? The High-Tech Social Worker — Myth or Reality? Is the profession ready to enthusiastically embrace technology while recognizing there are still unique clinical interactions technology may never duplicate? Jane Addams may not have anticipated technology's influence on social work practice, but today social workers increasingly rely on digital tools. Online therapy, advocacy by social media, and earning an MSW degree online are just a few of the tech innovations in recent history. The future is here, and social workers are revolutionizing practice with technology. But a culture clash exists between early adopters and traditional practitioners and other barriers have made it difficult for social workers to go high tech. The coming together of innovators and traditionalists, keeping up with the digital revolution, and weaving this into our practice will determine the course of our profession. Technology is ubiquitous and proving to be impactful in every facet of our lives. Worldwide, more than 3.2 billion unique subscribers—an estimated 47% of people on the planet—are using mobile technology (Cosner Berzin, Singer, & Chan, 2015). But how we make the leap from personal to professional use of technology is another concern. A recent editorial in the Journal of Social Work Education summarizes this challenge well: "Using technology personally is not the same as being digitally literate professionally. … Digital literacy requires reflection, analysis, and discussion in addition to technical skills" (Robbins, Coe Regan, Williams, Smyth, & Bogo, 2016). We have also been in the midst of a major technology revolution that has transformed the workplace. Many industries are using technology to learn and create products and services in entirely new ways and, in some cases, eliminate or significantly alter job categories. There is also a greater demand for technology skills to perform in jobs. In MIT Technology Review, Rotman (2014) discusses the role of technology in income inequality in our country: "Simply put, as we get better at automating routine tasks, the people who benefit most are those with the expertise and creativity to use these advances. And that drives income inequality: Demand for highly skilled workers rises, while workers with less education and expertise fall behind." How social workers draw parallels to this trend and examine the inequalities that may exist within our profession by not adapting to technology and connecting this to professional practice will make a difference. The American Academy of Social Work and Social Welfare has identified harnessing technology for social good as one of the 12 Grand Challenges of Social Work. As a reflection of this challenge, social work associations are using online tools to communicate with social workers and have robust presences on social media. In this regard, the Association of Social Work Boards (ASWB)'s Approved Continuing Education program indicates that the listings for online courses far outnumber face-to-face courses. In addition, the Council on Social Work Education (CSWE) (2016) reports more than 36% of accredited baccalaureate programs and 60% of master's programs offer all or part of their program in an online or hybrid format. Also, 17.6% of programs at the master's level are entirely available online. NASW hosts virtual career fairs, uses social media for Social Work Month efforts, and provides virtual continuing education. NASW is also in the midst of overhauling their website to enhance the digital experience for busy social workers. While social workers are embracing technology practices, some practitioners are resistant to going digital and run the risk of becoming the dinosaurs of our profession. Once we acknowledge and identify barriers, the social work profession will be on the way to becoming more tech savvy. There are many reasons for the uneven adoption of technology in the social work profession. Change can be uncomfortable, people are uncertain about how technologies will impact practice effectiveness, and the idea of giving up the in-person connection with clients seems counterintuitive. Not to mention, access to technology can play a role. "Fear of the unknown and the cost of the equipment and service are two factors for the resistant," says Mirean Coleman, MSW, LICSW, CT, a senior practice associate who leads NASW's clinical practice specialty. "Social workers in large organizations may have more exposure to technology." "Social workers are unsure how technology will impact personal relationships with clients; there are misconceptions about the value of cyber therapy and there are questions about ethics and whether their clients can afford technology tools," says Jimmy Young, PhD, a social work professor at California State University, San Marcos and cofounder of the Social Work and Tech Google+ community group. "The social work profession reflects generational differences in acceptance of technology. Traditionalists and baby boomers have not embraced technology in the same ways as the gen-Xers and millennials, who are digital natives and depend on technology for their work and life interactions," says Mary Jo Monahan, MSW, LCSW, CEO of ASWB. In keeping with Monahan's thought, "Social Media Use by Age Group Over Time," a Pew Research Center on Internet Science and Tech report, showed as of January 2014, 74% of adults use social networking sites; 89% are 18 to 29, 82% are 30 to 49, 65% are 50 to 64, and 49% are older than 65 (Perrin, 2015). Barriers to technology use are not just attitudinal. The Health Information Technology for Economic and Clinical Health Act of 2009, which provided more than $19 billion for incentive payments to support the meaningful use of health information technology, excluded behavioral health providers. This has slowed technology adoption at the provider level where many social workers are employed. A 2012 health information technology survey by the National Council for Behavioral Health found 30% of survey respondents identified "upfront financial costs" as the leading roadblock to implementing to health information technology and that only 2% of community mental health and addictions treatment organizations felt ready to meet meaningful use requirements. In early 2016 there was legislation on Capitol Hill to expand the federal electronic health record (EHR) incentive payments to include behavioral health providers, but Chuck Ingoglia, MSW, senior vice president of public policy and practice improvement for the National Council for Behavioral Health, suggested there was little chance this will pass in Congress. While attitudes and policies around technology use in direct practice are shifting, the greatest change has been the emergence of online counseling. This trend sped along for years by the necessity to serve hard-to-reach populations has intensified in an on-demand culture created by technology. There are many pros and cons to consider. "The advantages include accessibility of records and services to those who are homebound or living in rural communities. It allows for global communication, and for use in any setting," Coleman says. Drawbacks include "the lack of personal face-to-face contact, concerns of privacy and confidentiality, and difficulty maintaining work boundaries," according to Monahan. One of the bigger challenges, now that technology has made it possible to provide counseling from anywhere, concerns licensure. "Social workers practicing across jurisdictional boundaries creates regulatory challenges, which include ensuring the social worker using technology-assisted practice is licensed in the jurisdiction where the client is located and that the practitioner is practicing competently, safely, and ethically so that no harm comes to the public," Monahan says. ASWB has been committed to practice mobility and license portability since 2013. In 2015, ASWB appointed a Mobility Task Force to explore solutions that may include an online and universal licensure application, a central credential database, and secure web-based portal for licensing boards to access licensure applications and associated documents. A mobility plan is in development and slated to be approved by ASWB's membership in late 2017. The recently launched website MovingSocialWork.org will help share information about ASWB's practice mobility and license portability efforts and gather input for this important initiative. "Technology will take a lead role in the licensure mobility initiative by allowing for greater efficiencies, eliminating redundancies across jurisdiction boundaries, and providing specific assistance to applicants on how to meet licensing objectives," Monahan says. Other technology tools are impacting clinical practice. The EHR is a necessity to maintain confidentiality, secure payments, and effectively operate a private practice or agency clinic. Although modern EHRs have streamlined practice, they have also created ethical considerations concerning confidentiality. "Clinical social workers should establish a policy on record retention and disposal that is consistent with state and federal laws or agency policies and communicate it to the client," says Melissa Johnson, CEO of the Clinical Social Work Association (CSWA). "There also should be a 'professional will' for the proper handling of client records and protects privacy in the event of a clinician's death or disability." The EHR is a strong internal tool for a private practice, but social workers are using public-facing social media more for professional promotion, a situation that may impact the therapeutic relationship. "Clinical social workers should not engage in personal virtual relationships through social media with people they have or have had a therapeutic relationship," says Johnson regarding the CSWA's ethical committee recommendations. Johnson further recommends clinical social workers with professional presences on the internet separate them from personal pages to avoid dual relationships. There is a growing need for clinicians to craft a social media policy to clarify the professional relationship and informed consent around the risk and benefits of using technology. Macro social work practitioners, who might have once felt homeless in the profession, now have a place to commune with like-minded colleagues at the weekly #MacroSW tweet chats held every Thursday at 9 PM Eastern Standard Time. This chat addresses big issues and connects colleagues and students from all over the country. This online community, launched in 2014, is bustling with conversations every day—social workers networking and sharing ideas about social justice and advocacy issues. As of October 2016, this hashtag was host to 128,281,866 impressions (39,702 tweets by 3,787 people). "We started the #MacroSW Twitter chats as a way to hold conversations about this oft-overlooked aspect of our profession, and for which there was not any other independent forum," says Patricia Shelly, MSW, director of community engagement and expansion at the School of Social Work University at Buffalo State University of New York and #MacroSW partner. "Since its beginning, participation in the chat has grown exponentially, reflecting the strong desire for building community among macro social workers." This is one example of the type of professional online community that has cropped up all over the internet in many different professions and industries. On Twitter, for social workers and mental health professionals, there's also the #SaturdaySchool, a weekly chat about academics and rights-based issues; #SPSM, a weekly chat which curates suicide prevention resources; and #SWTech to discuss technology and social work. A Social Work and Tech community on Google+ has 1,196 members and the virtual international social work association husITa16 focuses on information technology. Advocacy has been transformed by social media and technology, with the most famous example being the #BlackLivesMatter movement. What started as a frustrated Facebook post about the Trayvon Martin verdict in 2013 today is a full-blown movement. Social media's ability to reach into the ethos and engage people instantaneously and organize has accelerated the speed in which positive change can happen. Social workers are now a part of the growing list of online activist movements that include the Arab Spring, #BringBackOurGirls, and #IceBucketChallenge, just to name a few. The explosion and myriad of technology tools available to augment micro and macro practice social work is necessitating the profession to better guide social workers in the ethical use of such emerging technologies. While the NASW Code of Ethics provides a solid basis for how social workers can conduct practice, the more than 10-year-old NASW and ASWB Standards for Technology and Social Work Practice is now finally being updated. The major social work professional organizations participated in drafting new standards and solicited comments nationwide. In June 2016, the tech standards committee released their first draft and provided an open comment period for feedback. The committee, led by Frederic G. Reamer, PhD, a professor at the School of Social Work at Rhode Island College and a member of Social Work Today's editorial advisory board, is in the process of reviewing more than 100 pages of comments from profession experts including both positive affirmations and pointed critique about how the draft standards can be improved. "The comments received from the public were very helpful, constructive, and thoughtful. NASW appreciates the time that members and nonmembers took to review the document and make comments," Coleman says. "The final document is expected to be available in the spring of 2017." "Our goal is to complete the draft by December 2016 and send it for adoption to the four social work organizations: ASWB, NASW, CSWE, and CSWA. As soon as each organization has approved the document, it will be published," Monahan says. There is a growing body of resources and journal articles around technology and social work practice. To name a few, social workers can check out articles in Journal of Technology in Human Services, Journal of Evidence-Informed Social Work, and Clinical Social Work Journal. The University of Buffalo website (socialwork.buffalo.edu) has a great listing in the Community Resource section. There are also active ways to learn, such as taking part in a Twitter chat and being curious about digital technology. "The most important value is to embrace lifelong learning; play with new tools and take chances," says Melanie Sage, PhD, LICSW, an assistant professor and bachelor of science in social work program director at the University of North Dakota, who is currently cowriting a book on using technology in social work education with Laurel Hitchcock, PhD, and Nancy Smyth, PhD. "As a practice parallel, you shouldn't practice CBT [cognitive behavioral therapy] without training, so if a technology-related practice is emerging for a population you serve, you are obligated to get engaged. We cannot just opt out of technology in our practice. Once upon a time, the telephone and e-mail were also novel tools." So is the high-tech social worker a myth or reality? Many leaders in the profession say, yes, the high-tech social worker is a reality. Their thoughts are not unfounded since it is undeniable that social workers are using technology in their practice. But this author doesn't believe the social work profession is keeping up fast enough or open to using digital tools. The high-tech social worker seems like more of a myth, although there are some pockets of innovation and a willingness to experiment. There are too many social workers lagging behind in tech adoption or too fearful and stuck in the status quo. If professionals are nervous about how technology will change social work practice, we should remember there are social work skills that technology will never replace. Our empathetic capacity, clinical skills that can heal the worst traumas, and our passion and understanding of and for the needs of underserved and marginalized populations will never waver. How we use technology to deliver these unique skills and solve big problems still remains to be seen. Cosner Berzin, S., Singer, J., & Chan, C. (2015). Practice innovation through technology in the digital age: A grand challenge for social work. Retrieved from http://aaswsw.org/wp-content/uploads/2015/12/WP12-with-cover.pdf. Council on Social Work Education. (2016). Annual statistics on social work education in the United States: 2015. Retrieved from http://www.cswe.org/File.aspx?id=94118. Perrin, A. (2015). Social media usage: 2005–2015. Retrieved from http://www.pewinternet.org/2015/10/08/social-networking-usage-2005-2015/. Robbins, S. P., Coe Regan, J. A. R., Williams, J. H., Smyth, N. J., & Bogo, M. (2016). From the editor — The future of social work education. Journal of Social Work Education, 52(4), 387-397. Rotman, D. (2014). Technology and inequality. Retrieved from https://www.technologyreview.com/s/531726/technology-and-inequality/.